You just got a second computer and you want to connect it to Internet? 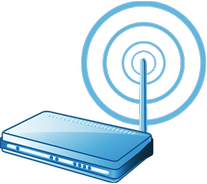 You would like to connect your laptop and your mobile devices (smartphone and iPad®, Android®, Windows®, Blackberry® tablets) to Internet through a wireless connection (WiFi)? Or you want to prevent your neighbourgs from using your Internet connection? SOS Ordi Montréal® can help you by installing, configuring and securing your local network (no matter how many computers you have...). We can also configure printer and files sharing between your devices. If you don't already have all the necessary hardware (cables, router (for Internet connection sharing between several computers)), the technician will provide everything you need (use the contact page for more information). If you choose the wireless connection, the technician will secure your setup in order to prevent neighbours using your Internet connection without your authorization. Moreover you will be able to use your local network if you move, wherever you move!! © 2009-2019 - SOS Ordi Montréal®. All rights reserved.